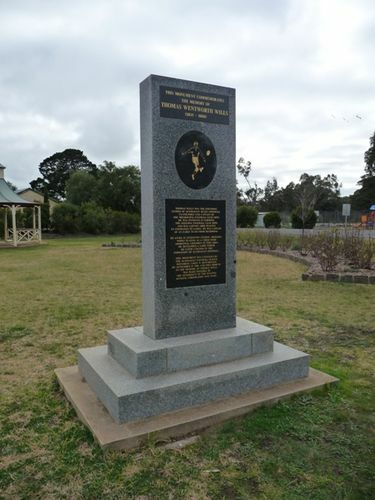 Memorial erected in memory of the founder of Australian Rules Football, Thomas Wentworth Wills (1835 - 1880) whose grave is in the Warringal Cemetery in Heidelburg. 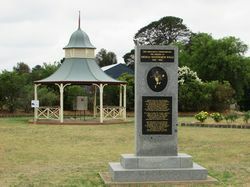 The gazebo behind the memorial contains a six-sided history of Australian Rules. Thomas Wentworth "Tom" Wills was a 19th-century sportsman who is credited with being Australia's first cricketer of significance and a pioneer of the sport of Australian rules football. In 1858 he called for the formation of a "foot-ball club" with a "code of laws" to keep cricketers fit during the off-season. After founding the Melbourne Football Club the following year, Wills and three other members codified the first laws of Australian rules football. He and his cousin H. C. A. Harrison spearheaded the new sport as players and administrators. 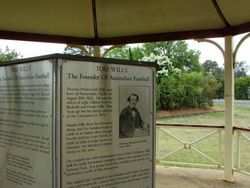 Thomas Wills was the founding father of Australian Rules Football, Co-Founder and captain of the Melbourne Football Club (1859). He was involved in forming the Geelong Football Club (1859) and was captain (1860) playing an estimated 172 games. He was captain of an early team from Richmond. He lived at Lexington Station, Moyston. While playing as a child with aboriginal children in this area he developed a game which he later utilised in the formation of Australian football.